This fun design for fans of Star Trek is inspired by video game ratings. Warn those around you that you're a big Star Trek fan with this original fan-created Trekker design. Trekker t-shirts and gifts for Star Trek fans! This fun design for fans of Star Trek is inspired by video game ratings. Warn those around you that you're a big Star Trek fan with this original fan-created Trekkie design. Trekkie t-shirts and gifts for Star Trek fans! Faith of the Heart t-shirts & gifts. Novelties for Trekkers and sci-fi fans. Do you miss Captain Archer, T'Pol, Trip & Porthos? This is a great design for trekkies longing for a return to the beginnings of the Federation. 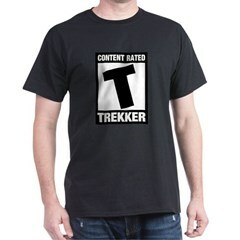 Funny Trekker fan t-shirts & Trekkie fan-created apparel and swag. Again with the shields! is the famous quote by William Shatner to Mr. Spock on the television commercial for DirecTV. This is a great gift for Star Trek fans! This official fan design features the Vulcan split finger hand signal. The meaning is Live Long and Prosper - and just in case you weren't sure, the slogan is spelled out in the hand. Clever Star Trek design! This original fan-created official Star Trek design features the history of the iconic USS Enterprise spaceship. From Enterprise NX-01 to the Enterprise-B to the USS Enterprise-J and more!